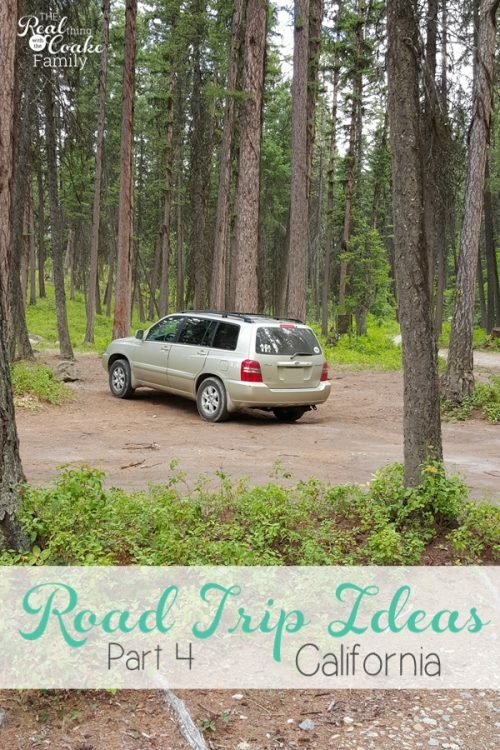 I'm already up to sharing week 4 of our 5.5 week family road trip. Being on a road trip, time seems to fly so fast! 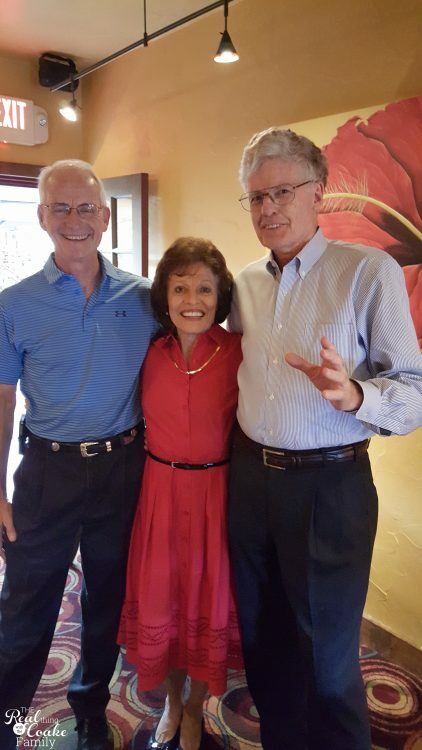 It was hard to believe that we were already on to the part of the trip that we would fly to California and spend time with my husband and my family to celebrate my parent's 50th Anniversary. You guys, if you ever got on a road trip as long as we did, I have to tell you that time will fly. Especially if you are the only adult and still working on the road. I was exhausted by this point with trying to keep up with work on this blog as well as driving and sightseeing during the day. Thankfully I had gotten all of the posts completed for the week we were in California as well as one or two past that week. It turns out to be a great thing because I had no reliable internet for the whole week. ::gasp:: I could have used my Verizon Mifi that I have just for times like that, but as we had been on the road for 3 weeks already, I was already WAY over my data allotment for the month. A whole week of using only my Mifi would have totally done this budget-conscious mama in. Anyway, It turned out a nice break and getting 8 hours of sleep mosts nights was just what I needed. Let me show you what we did our week in California. (affiliate link), which was our summer road trip theme song! 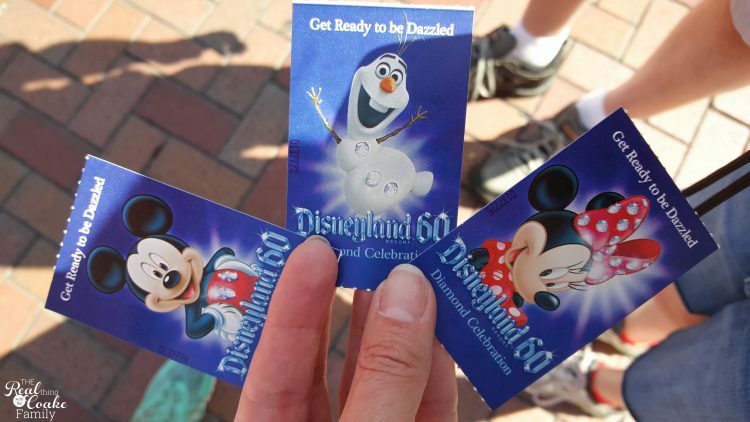 Disneyland never shies away from a celebration and a 60th Anniversary should be celebrated. 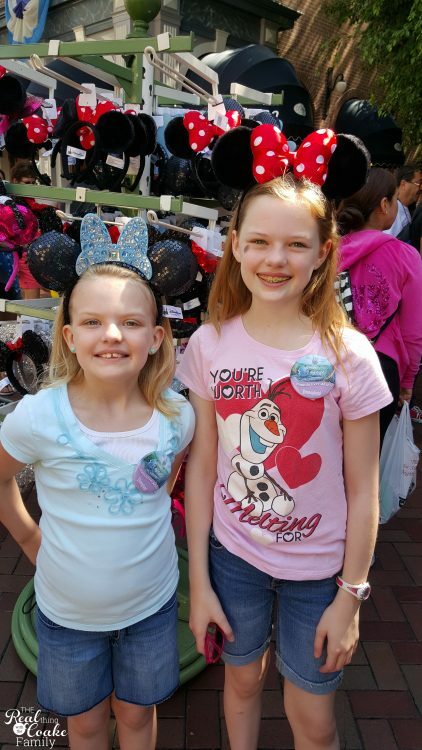 My girls started with some Minnie ears…a total must. They each had their own money that they had saved up. I have to say that it was a hard choice to spend the money on the ears. They are expensive! Snowflake (0n the right) bought hers immediately. Pumpkin really thought about it and got hers much later in the day, I'm so glad to see my kids really thinking things through with money. For Snowflake, she knew she had plenty of money at this point and she really wanted the ears(which were $20). She is also not my impulsive kid with money. Pumpkin, who tends to be a bit more impulsive with her money, was so impressive on this trip. She really thought things through. 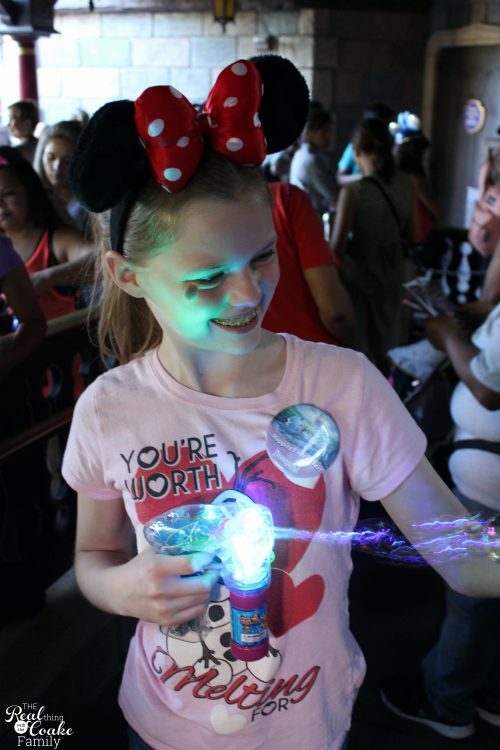 She checked out tons of Disney souvenirs and thought out it all before she settled on the ears (which the pair she bought were $27 if I remember correctly…geez… expensive). I couldn't wait for my girls to see Cinderella's castle. I knew they would love it. I just had no idea it would be all decked out for the 60th Anniversary. It was so pretty! It was also so much smaller than I remembered from when I was at Disney many times as a kid and young adult. Funny how that is! Early in the day, I went to the Starbucks at Disneyland. 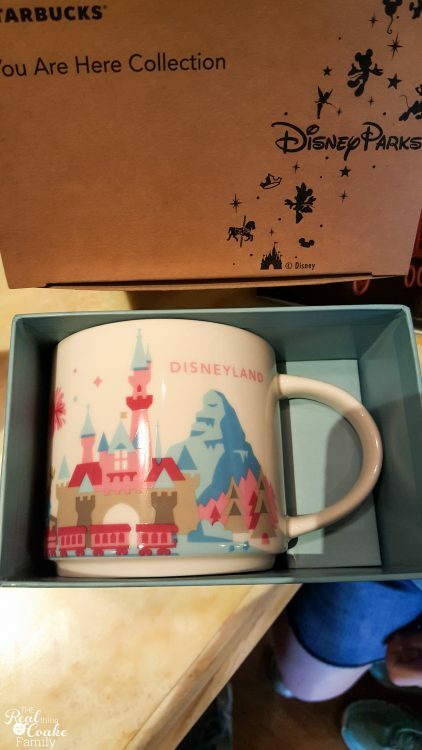 I knew I wanted my souvenir to be another mug for my You are Here mug collection. I LOVE this mug! I thought it was really neat that they have specific Starbucks cups for Disney. So fun! 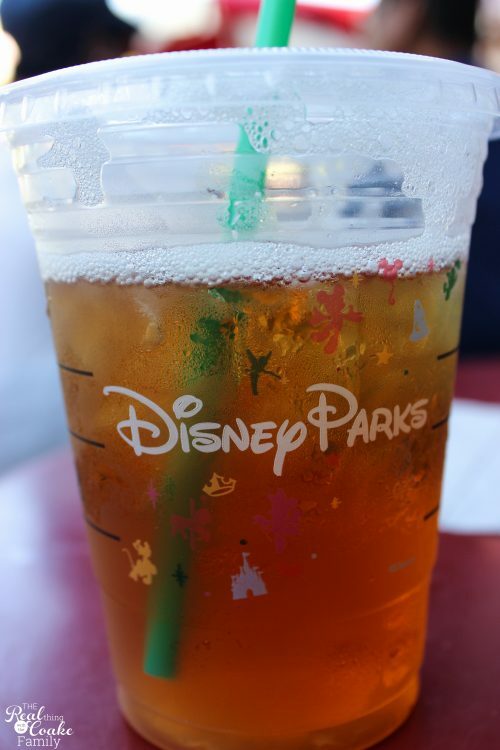 Disney (and Starbucks) just think of everything! 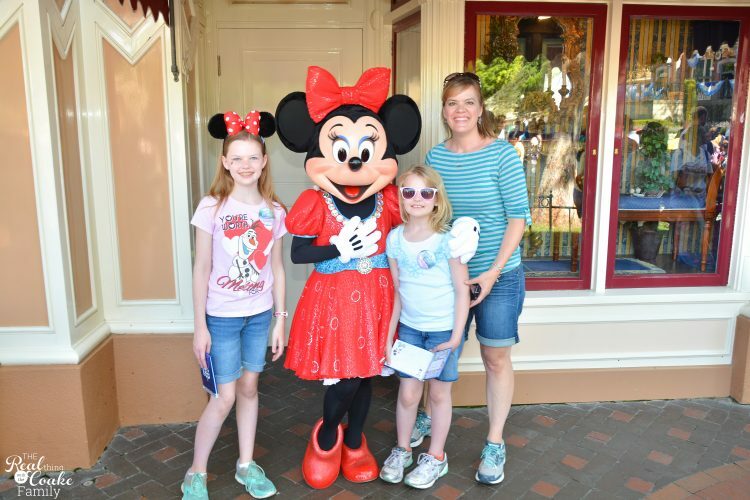 We had to meet Minnie Mouse! One of the things that make time at Disney so great is how much all of the employees and characters are just so sweet and helpful. 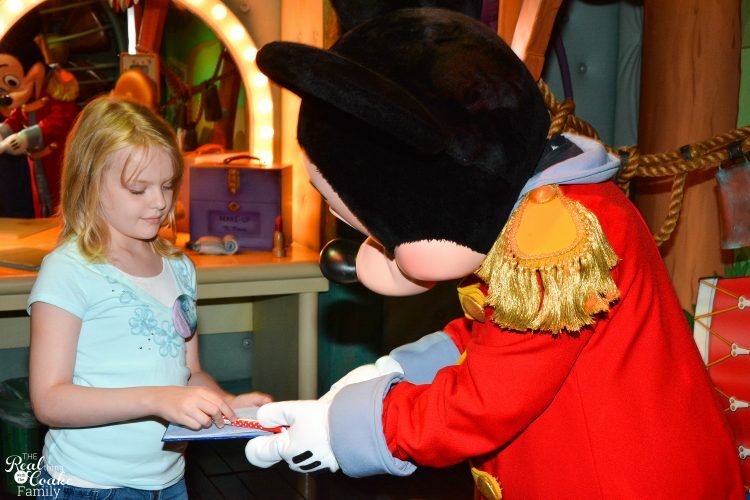 Meeting Mickey is a must as well. Early in the day, I bought my girls a treat of a souvenir autograph book. They loved meeting characters and getting autographs. 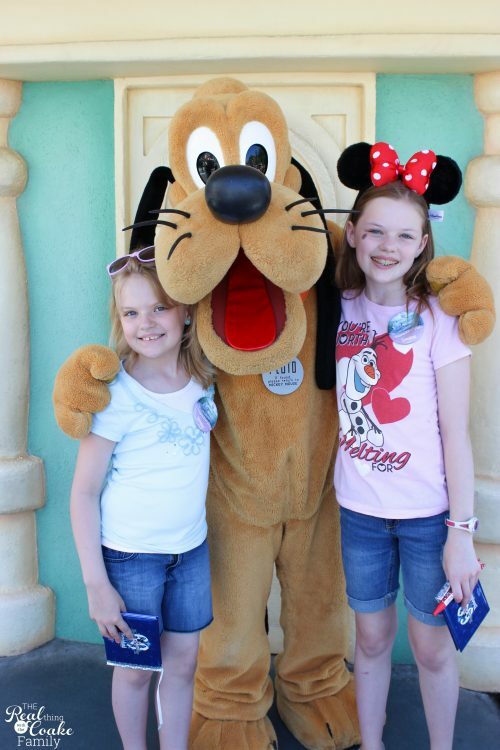 Pluto with my girls. 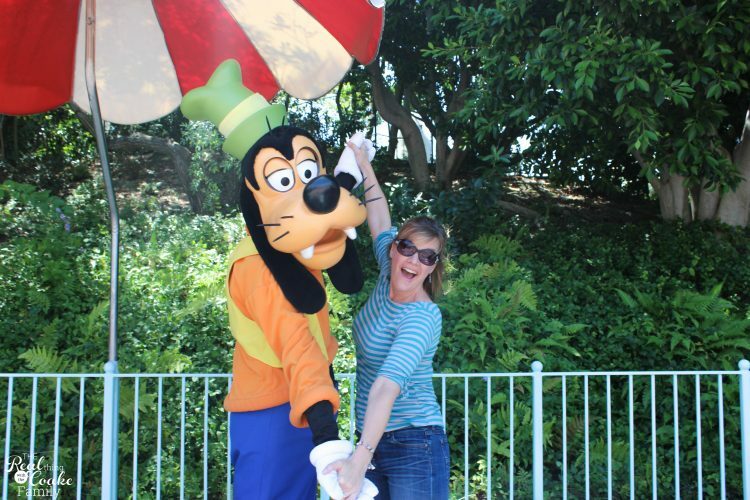 Disneyland is also great for all types of amusement park attendees. My girls don't really like riding rides. 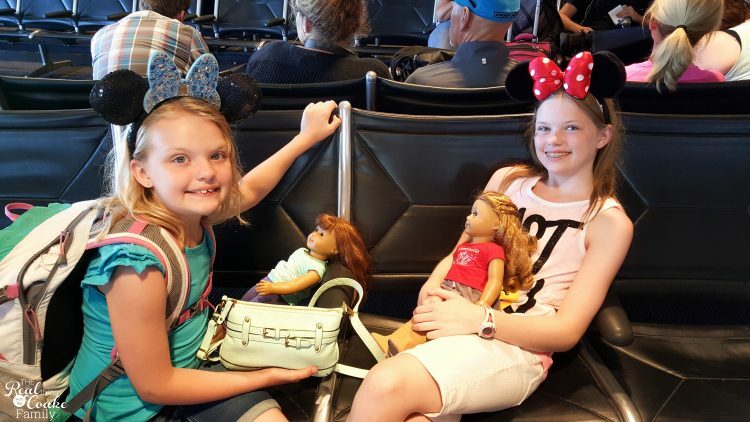 They still had a fantastic time at Disney. We went to shows and meet tons of characters. The park can be fun for everyone. 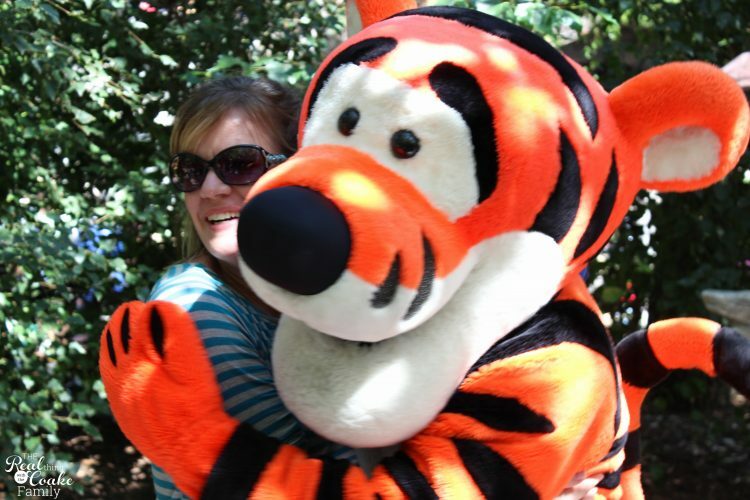 It seems like the characters are pretty good at sizing people up… They seemed to know I would love being silly with them. 🙂 Maybe it is the way I bounce up to them and want to have a pic as well. 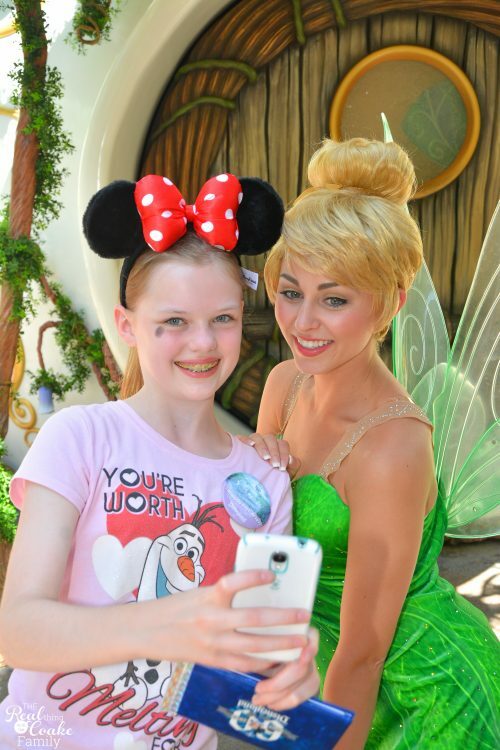 Our favorite character of the day was Tinker Bell. I didn't expect it, but she was so sweet and so cute with my girls. So in character as well. 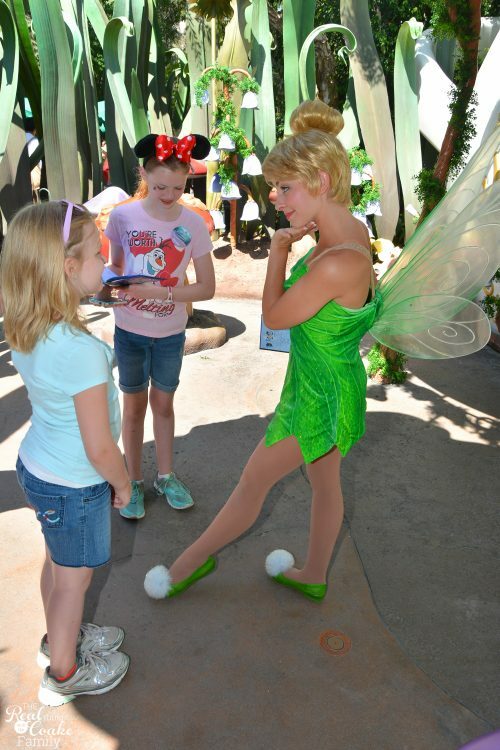 Now…I just want Tinker Belle's shoes. I need shoes with a Dandelion puff in a size 11, please. 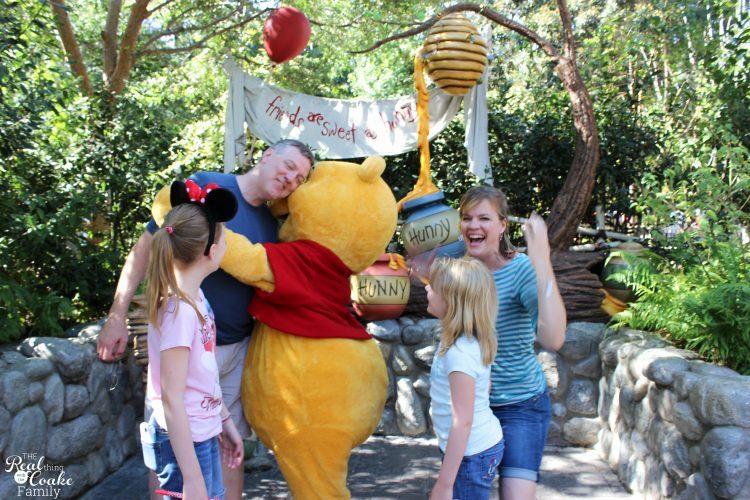 Now if you really want to have fun, tell Winnie the Pooh that your husband has some honey on him. Winnie the Pooh took me seriously! Lol! Too fun! It made for a great family picture. 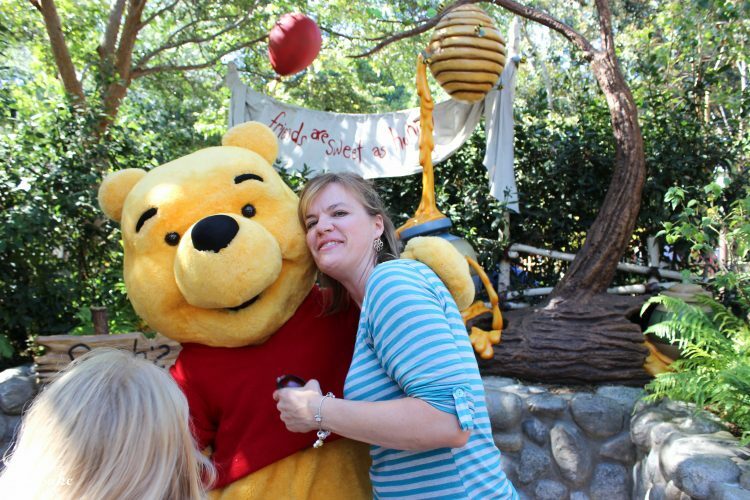 Winnie the Pooh looks like he is anticipating some yummy honey! Snowflake also decided to get a glow in the dark bubble gun. She had so much fun with the bubble gun. She loves younger kids and had fun entertaining them(and herself) in lines. 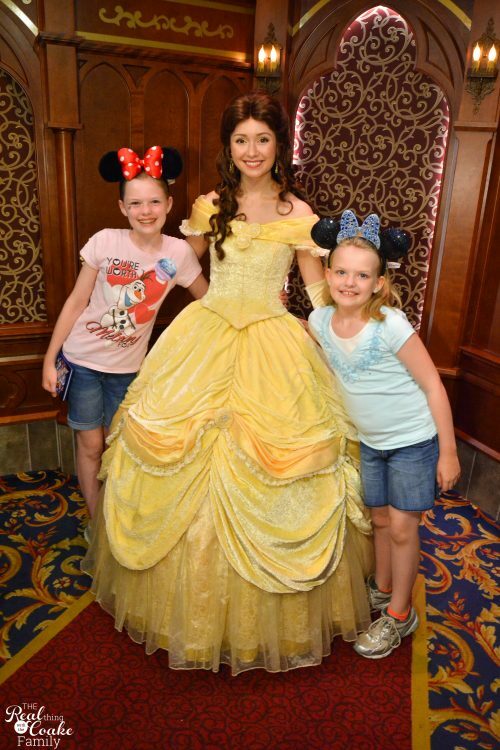 Belle is Pumpkin's (and my) favorite princess. We had to wait in line to meet here. She was so sweet and so regal. 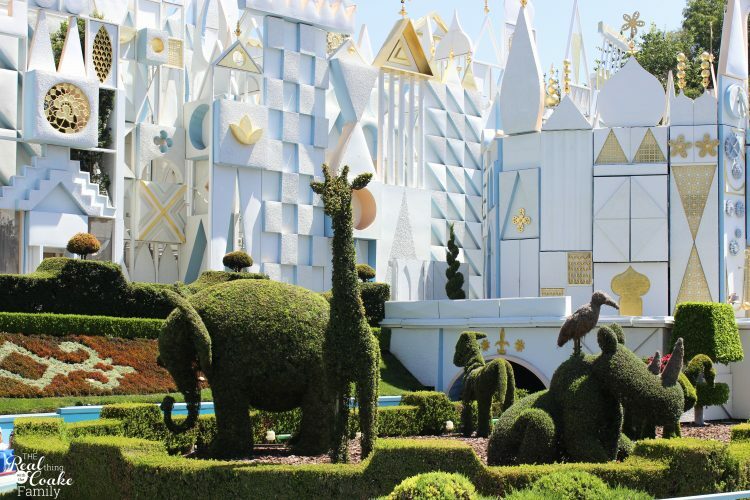 It's a Small World is a classic Disneyland ride and attraction. It is painted differently than I remember from when I was a kid. I've always loved the cute hedge animals. 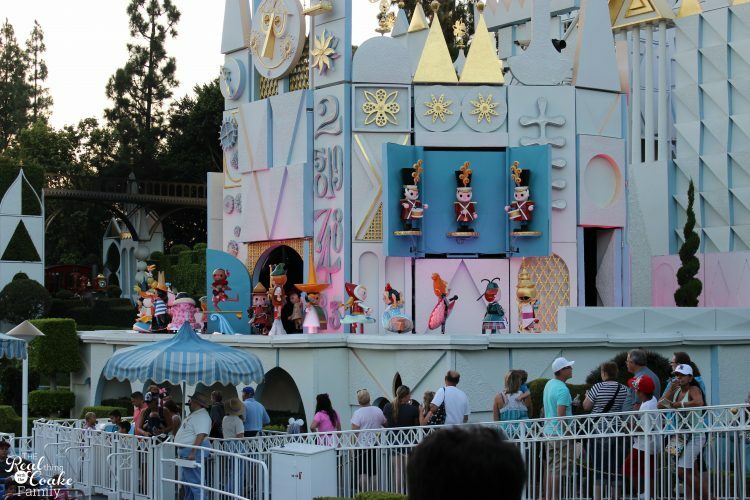 I can't remember how often, but I think it is every 15 minutes, the It's a Small World tower opens up and chimes the time with all the characters on display. It makes the time waiting in line a little more entertaining. 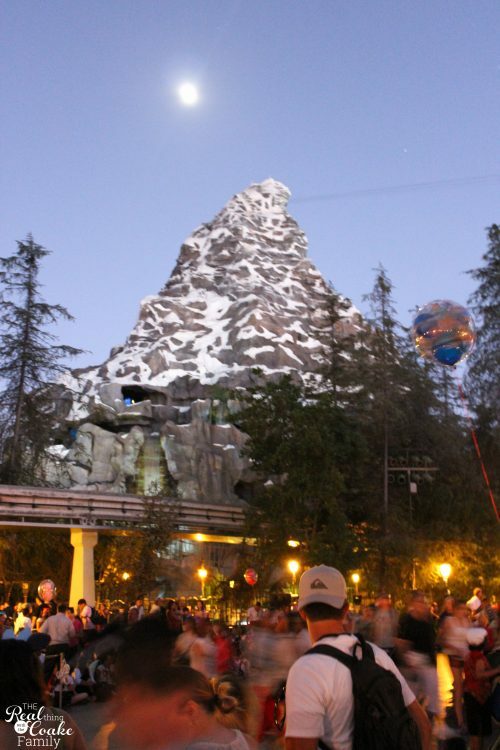 Just a picturesque view over the Matterhorn near dark. 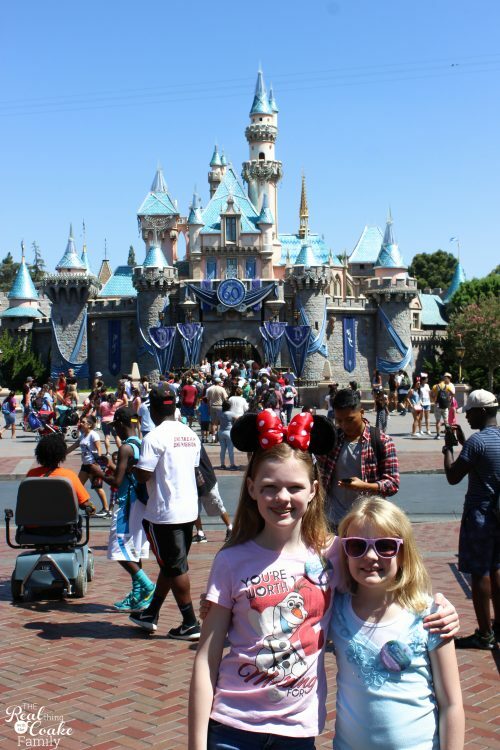 The one massive drawback to the day we spent at Disneyland were the crowds. I've been many times to Disneyland. I have never seen it as busy and full as it was the day we were there. It was insane. There were times that we had to do the preschool hand chain thing to get through crowded areas and make sure we didn't lose anybody. We waited an hour to ride the train and 30 minutes or more for a table to open up to sit down to eat. It was crazy. It was also hot. It is a good reason to stay for 2 days and just leave during the busy hot times and come back after about 4. There was a parade at 4:30 and another at 8:50. Those two times are when things started to thin out and get a bit more manageable. We accidentally got to see the 9:30 pm 60th Anniversary fireworks in the best location. We were eating dinner in Frontierland when we heard lots of sounds from a show on the Rivers of America. 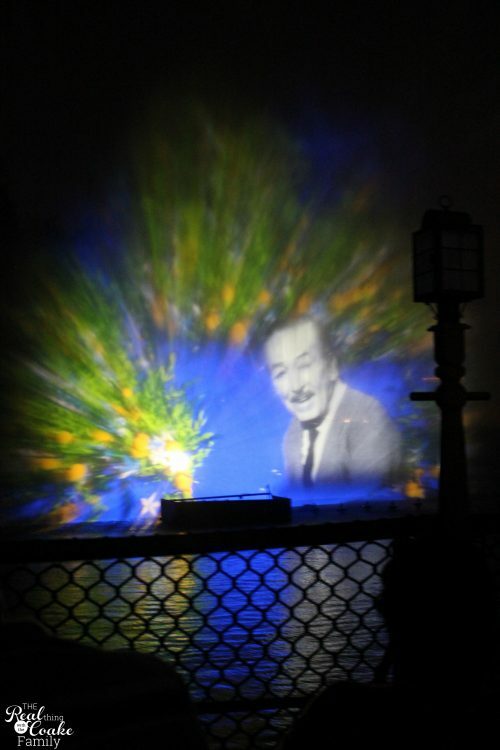 It turns out it was the Fantasmic show. I wish I had realized because we could have gotten FastPasses for good seats. That being said, my kids did not want to see the parts of the show that we did see. They are very sensitive to scary scenes and violence and didn't like it, but the seats would have been great for the 9:30 Disneyland Forever Fireworks. 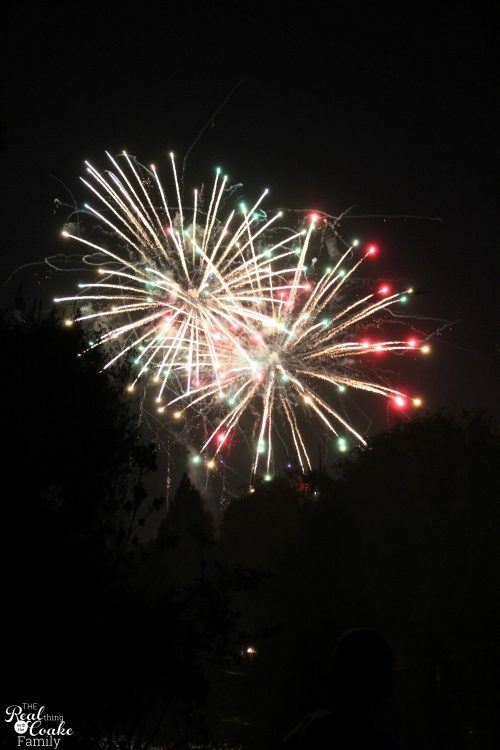 The fireworks were amazing. They use the Rivers of America and shoot up these walls of water. 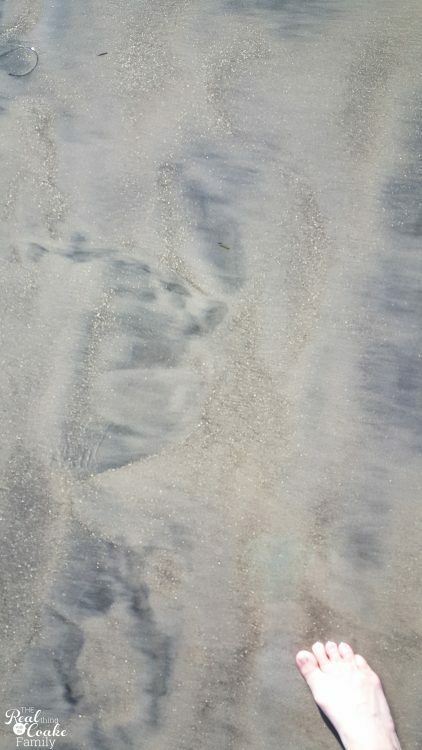 Then they project pictures onto the walls of water. That is what you see above. 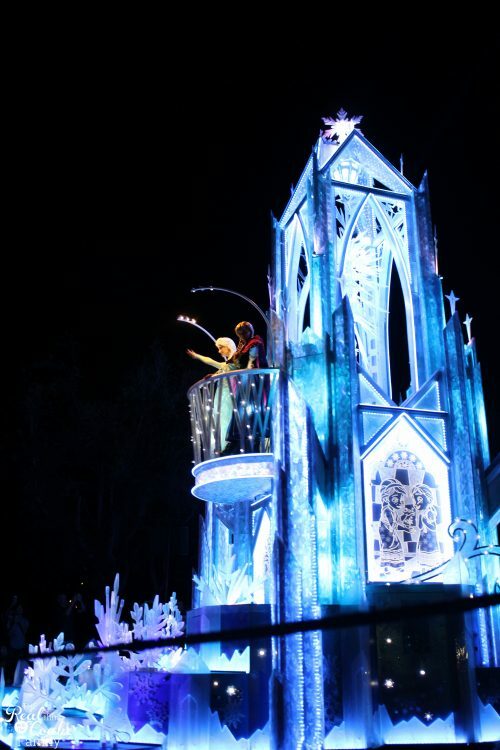 It is so amazing. The fireworks are timed with the show going on the water screens. Disney knows how to do it up right and the fireworks are fantastic and compliment the show going on the water. 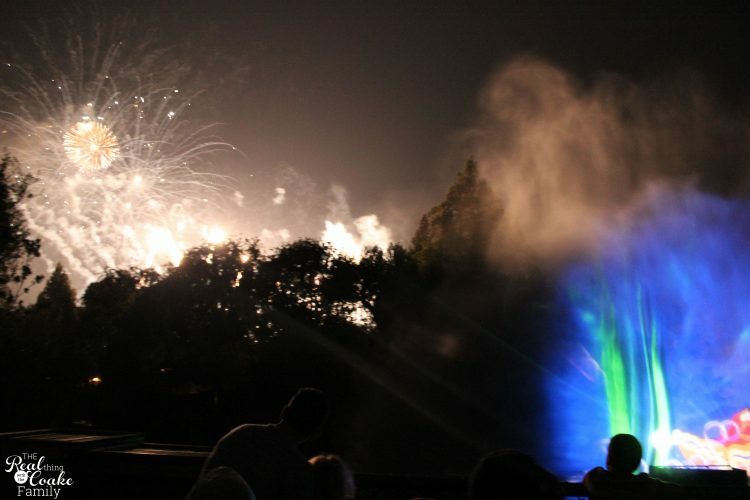 I tried to get a shot that shows the wall of water and the fireworks, it isn't that great of a picture, but it at least gives you an idea of what the show is like. 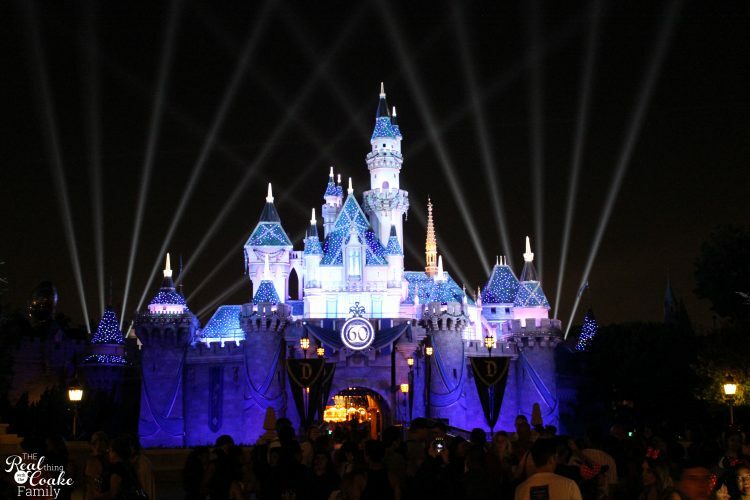 The castle is bedazzled for the 60th Anniversary. It is so pretty at night as well. After the Disneyland Forever Fireworks show, we found my brother and his kids. 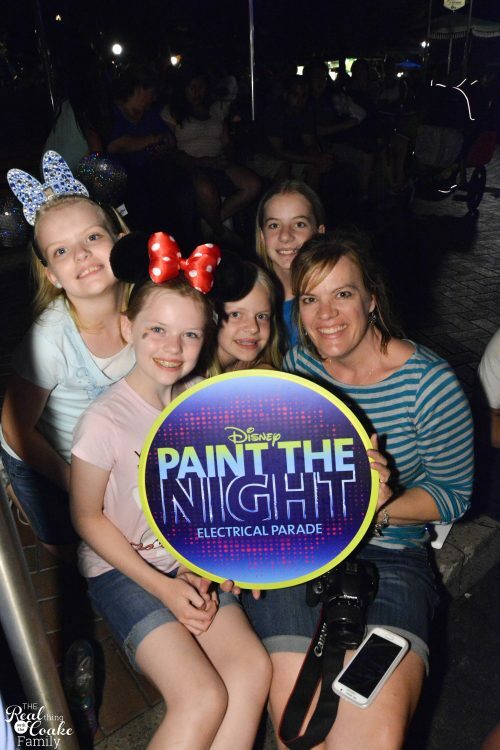 We all watched the Paint the Night parade together. 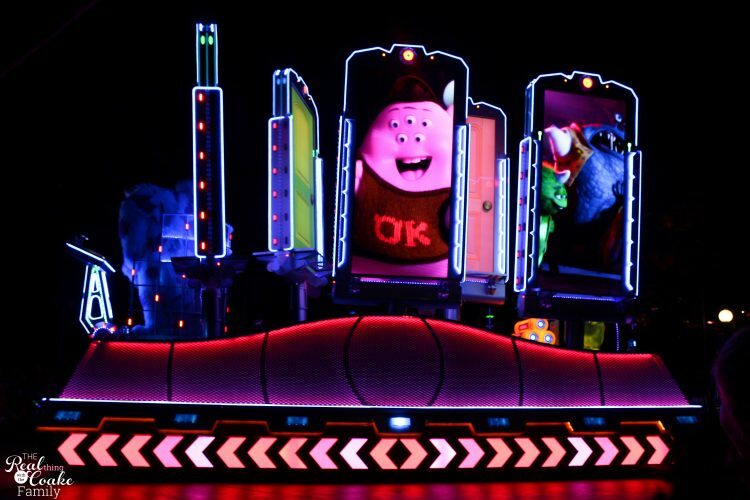 If you have ever been to an old Disneyland Electric Lights parade, the new Paint the Night parade is a modern-day version that is fantastic! All the favorite characters are part of the parade. 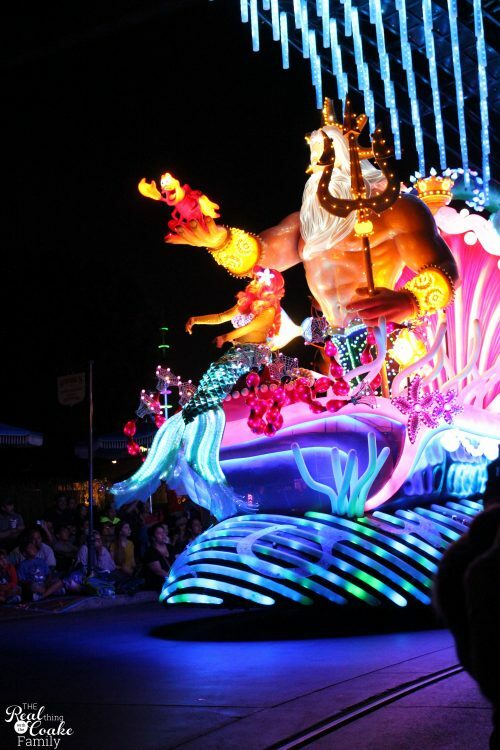 It is set to music that somehow Disney times perfectly to the floats that arrive in front of you on the route. The floats were so pretty and fun. 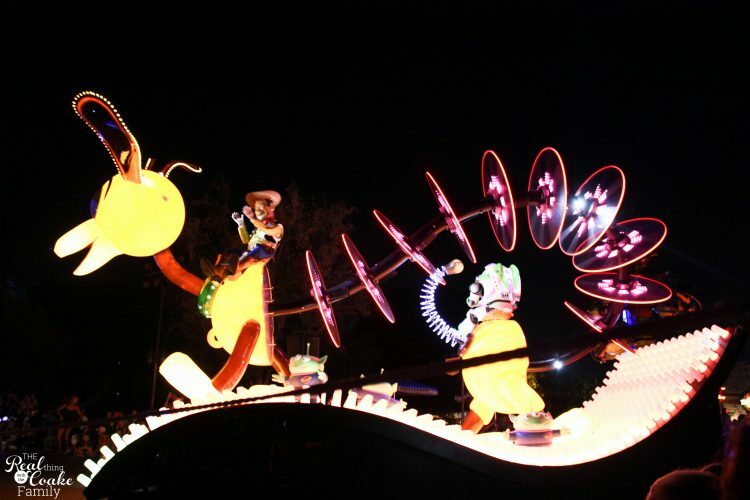 We stayed for the later parade (at 10:45 pm), but there is an earlier one if you don't want to be there to close down the park. 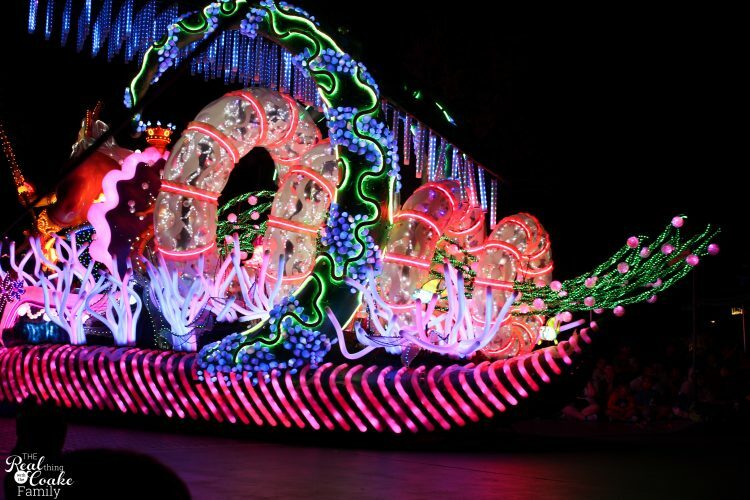 Any which way, you need to see the Paint the Night parade. It is fantastic! 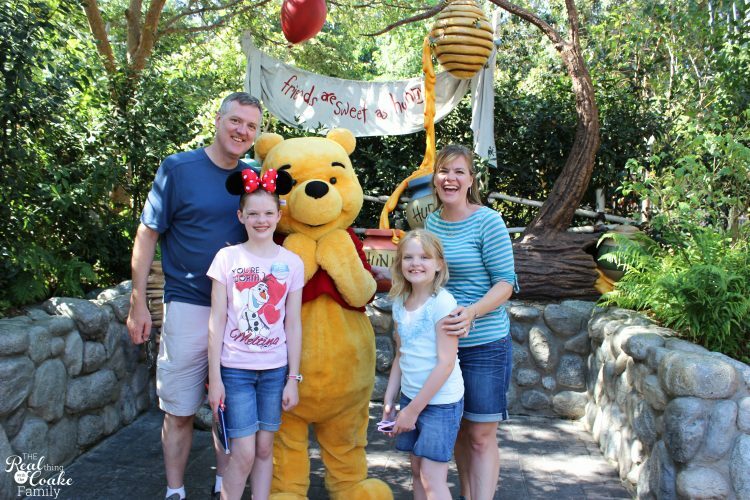 We spent some time with my brother-in-law and his family the following day (well 2 of them were with us at Disneyland as well, but we didn't actually spend much time together since my girls don't like rides). Coast to coast complete for our road trip. 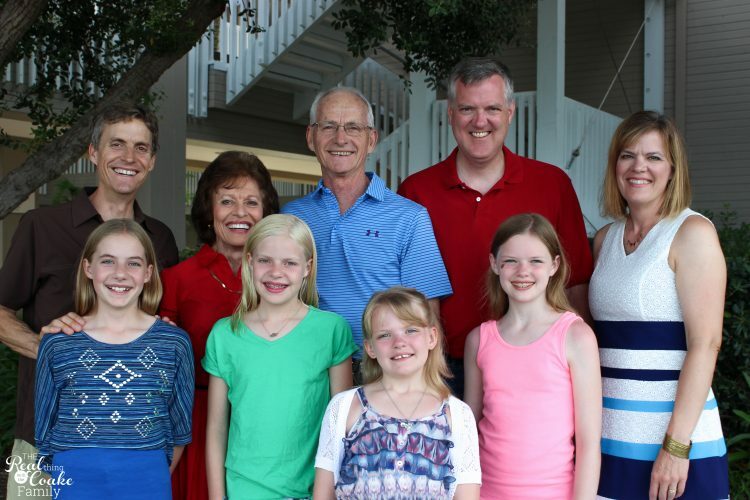 Dinner with the whole family on the beach…starting to celebrate my parents 50th. 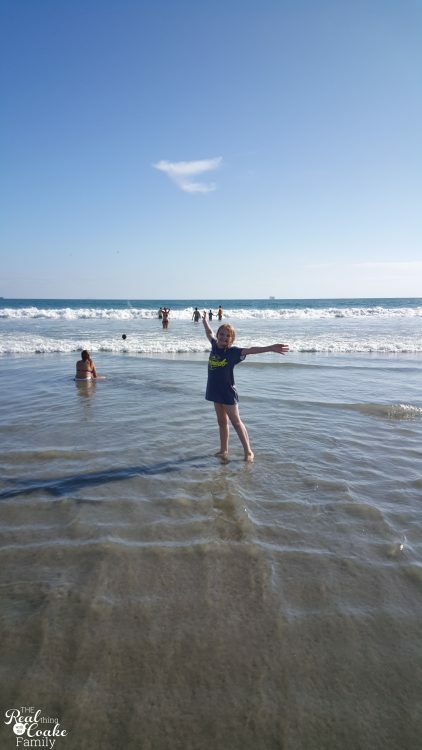 After Disneyland and time with the other side of the family, we headed to San Diego to be with my family. We started our time on Coronado Island with a picnic on the beach. This is when we officially made it from the East coast to the West coast on our road trip! Now if you have been on the road with 2 kids by yourself for 3+ weeks and you finally have someone who will take care of your kids and you can go for a run, don't go with no plan in a new place. Just saying. I did that and instead of running 3 miles, I ran/walked 5.5 miles. I ran most of a loop around the island, including running by the Hotel del Coronado. It was getting quite warm by the end since I hadn't left for my run until 9:45 in the morning. The sun is so much more intense in the West than it is in the humid area where we live, I had forgotten about that. Thank goodness I had borrowed my brother's water bottle. I added my next mug for my collection. We of course spent time at the beach (and the hotel's fantastic pool). 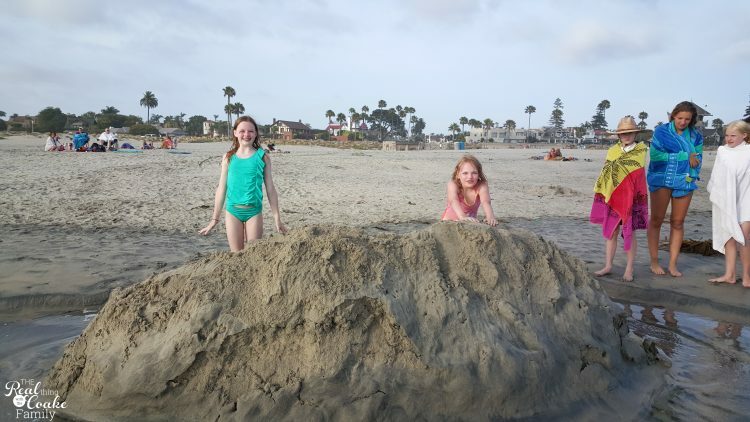 The girls found this huge sand mound someone had made. They had fun watching it (and helping it) disappear. We did manage to get out of swimsuits for a bit to go celebrate my parent's 50th Anniversary. I wore the dress from my last Stitch Fix. 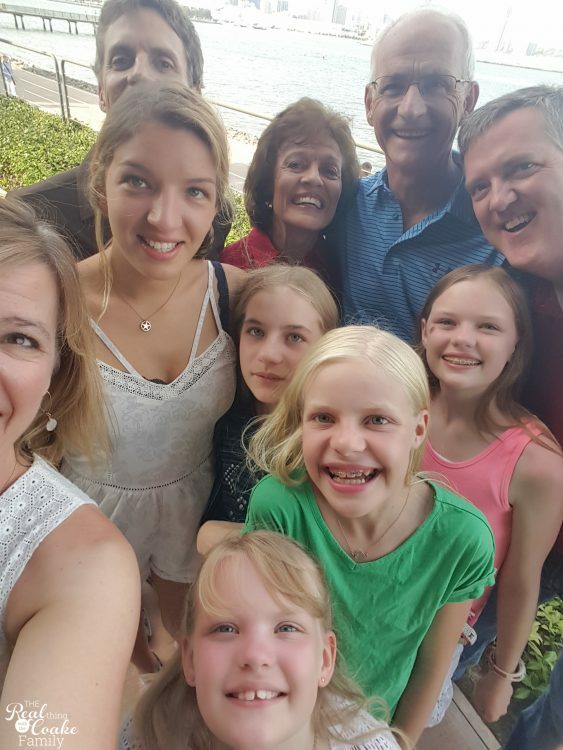 I'm thinking the family that selfies together, stays together. What do you think? I'm mostly just thinking I'm amazed that I figured a way to get us all in. 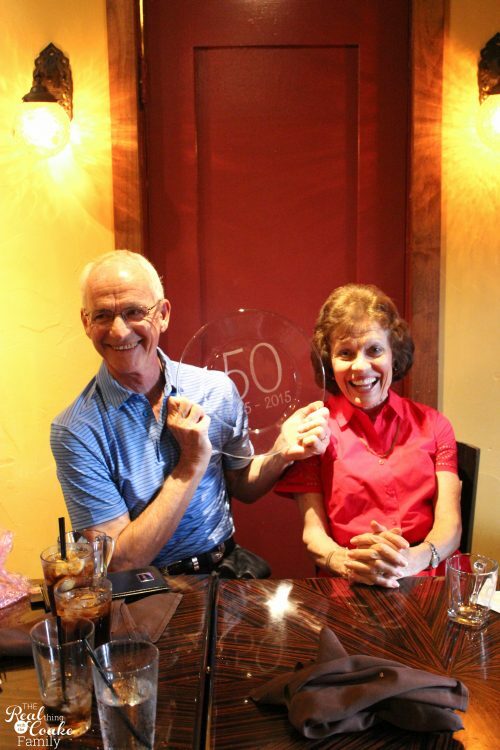 For my parent's 50th, I had a hand in helping surprise them. The Best Man from their wedding (on the right), lives near where I live. I have met him on different occasions when my parents are visiting and get together with him. He contacted me a few months before the Anniversary to see what was planned and wanted me to get him information so he could show up and surprise my parents. Everything went off without a hitch and he was totally able to surprise them. It was a great surprise and so great to have him join in the celebration. 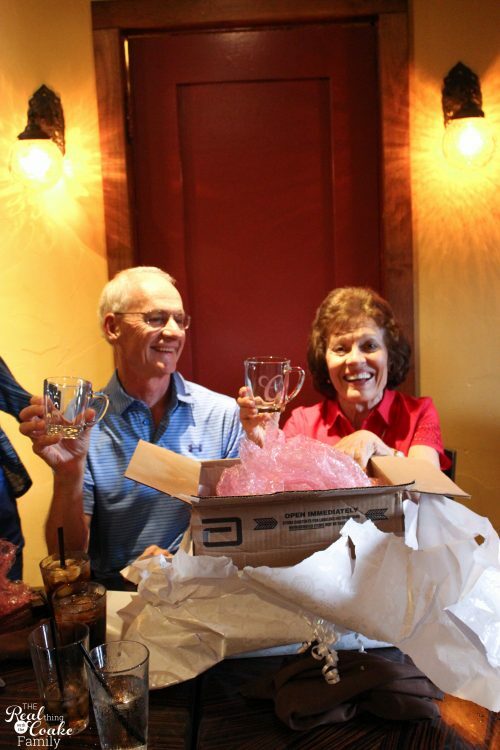 My parent's love the anniversary gifts I made them. Since I just showed you how to make the anniversary gifts a few days ago, I thought you might like to see them opening them. They like them…for sure. Renting bikes and biking around San Diego or Coronado Island is a must! 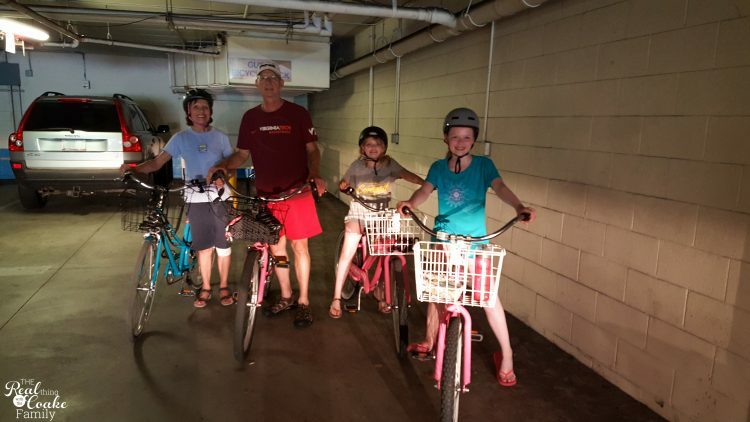 My girls had to bike with my parents. I am not allowed to ride a bicycle since my hip surgery a few years ago when I found out I have hip dysplasia. Boo! 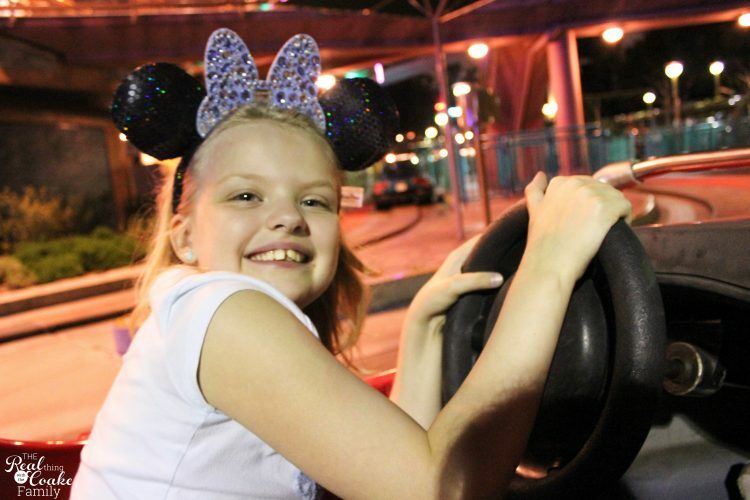 It was a bummer to not get to ride with them, but they had fun, so that is what matters. Ta Da! 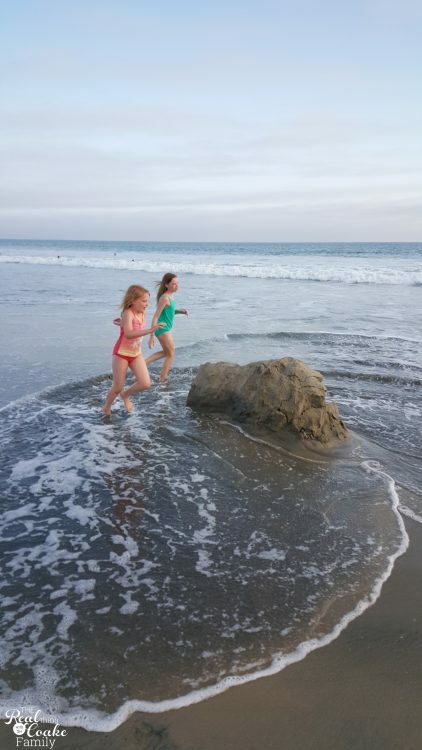 We love the beach and the Pacific Ocean. I got to go for one more run. Since I am not allowed to ride a bike, but the bikes had to be returned and we needed an adult with my kids, I ran while they biked. They say I am really slow. Lol! Yep…when you are on a bike and I have just eaten breakfast, I am super slow! lol! It was time to fly back to Portland and pick up our car from the airport parking lot. Can you tell they are exhausted from our week in Cali? 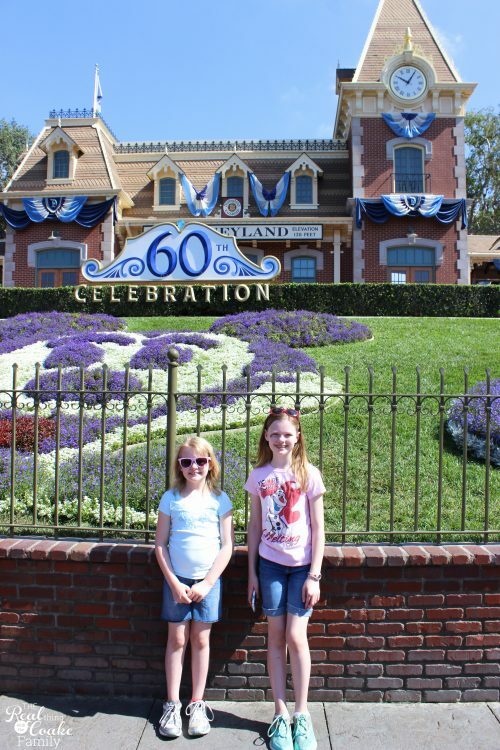 They had a blast and were totally exhausted…the best kind of exhausted! Next week, I will have either all of our journey back to the east or at least half of it. 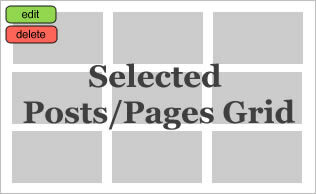 I haven't looked at those pictures yet to know if I need to split them into multiple posts or if they will easily fit into one. We accidentally found my favorite thing of the whole trip on our way home. I can't wait to show you! More great posts you will love!